Shenzhou 6 astronauts Fei Junlong and Nie Haisheng appear in work clothes in this video image taken from inside their reentry capsule. The two astronauts aboard China'sShenzhou 6 spacecraft spent their second day in orbit testing the stability oftheir vehicle and will guide it through an orbital maneuver Friday, thecountry's state media reported Thursday. Shenzhou 6 astronauts Fei Junlongand Nie Haisheng repeatedly opened and closed the doors between theirspacecraft's reentry and orbital modules - sometimes using exaggerated force -to check the hatch's integrity, according to China's Xinhua News Agency. As part of the "anti-disturbance"experiments, the astronauts also donned and doffed their bulky, 22-pound(10-kilogram) spacesuits, and tested a condensation water extraction systemaboard their spacecraft, Xinhua said. Zhang Shuting, deputy designer ofChina's spacecraft system, reportedly told the news agency that, with theexperiments concluded, Shenzhou 6 is fully capable of enduring whatever actionsits crew performs inside. Fei and Nie are expected to performan "orbital maintenance operation" early Friday (Beijing Time) to adjust theirspacecraft's flight around Earth, Xinhua said, adding that Shenzhou 6'strajectory had deviated toward Earth slightly. The two astronauts - also known as"taikonauts" - launchedinto space at 9:00 a.m. on Oct. 12 Beijing Time, about 9:00 p.m. EDT Oct.11(0100 Oct. 12 GMT), from Jiuquan Satellite Launch Center in northwestern China.The mission is China's second manned spaceflight and its first to carry atwo-astronaut crew. Shenzhou5, the nation's first manned flight, launched astronaut YangLiwei into orbit on Oct. 15, 2003. By mid-day Oct. 13 EDT, theastronauts had circled the Earth about 23 times and spent more than 34 hours inspace, breaking China's earlier human spaceflight record. During Shenzhou5, yang orbited the Earth a total of 14 times before landingsafely on the grasslands of Inner Mongolia 21 ? hours after launch. Before launch, Shenzhou 6'sspaceflight was anticipated to be a five-day mission, though recent unconfirmedstate media reports have suggested it may end up to two days early, accordingto the Shanghai Daily newspaper. While Chinese space officials havenot released an official announcement of any changes in Shenzhou 6's Earthreturn, the Shanghai Morning Post reported - citing an unnamed source -that the spacecraft could land in Inner Mongolia by 6:00 a.m. Beijing TimeSaturday, the Daily said, adding that another newspaper suggested theflight could land Friday. Both astronauts were reportedly ingood health as they concluded their second day of flight operations. Li Yongzhi, the spaceflight's chiefdoctor, told Xinhua that the astronauts will fill out a questionnaire,which details their orbital experiences such as sleep quality and other flightaspects, that is coded to protect their privacy. "Astronauts have their own privacy,"Li told Xinhua. "We are responsible for keeping it secret for them." 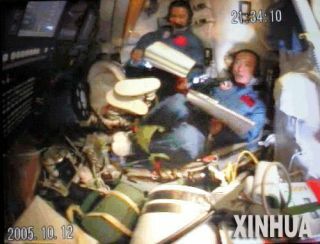 Li said that the Shenzhou 6 crew hadeaten four meals and each slept once, in seven-hour shifts, by the end of theirsecond day, the news agency reported. Some light was shed on theday-to-day living requirements of China's astronauts in Li's discussion with Xinhua. Li reportedly told the news agencythat Shenzhou 6's space toilet requires astronauts to use a soft plastic hoseand air pump system to collect waste in a sealed container for stowage. Scientists also prepared a chewinggum-like cleanser, edible toothpaste and a "tooth-cover" made from germ-freegauze for Fei and Nie to use to clean their teeth, as well as special wipes andmoisturizer for body cleansing, Xinhua said. Meanwhile, even as Fei and Nie orbitEarth aboard Shenzhou 6, new details emerged in China's press Thursdayregarding the country's next two manned spaceflights. According to the Shanghai Daily newspaper,China's third manned mission - Shenzhou 7 - will launch in 2007 and is expectedto include a tethered spacewalk and a docking experiment. The Daily quoted Han Hongyin, of theShanghai Academy of Spaceflight Technology, who reportedly helped design thepropulsion system used by Shenzhou vehicles, on the launch projection. "We will test space technologyindividually before the launch of the country's first space station," Han toldthe Daily, adding that at least two astronauts would fly aboard Shenzhou7. The Daily quoted Han assaying that an actually docking between a Shenzhou vehicle and an unmannedorbiter target would be reserved for a Shenzhou 8 mission, though did notspecify a potential launch target for that flight. In a separate report, Zhang Bainan -chief designer of China's spacecraft system - told Xinhua that theShenzhou vehicle to fly on the Shenzhou 8 mission will become the country'sfinal spacecraft design for future flights. Minor changes may be required tosuite the specific needs of individual flights, but the basic shape, controlsystems and data transmission protocols will be identical in spacecraft fromShenzhou 8 onward, Xinhua reported. Shenzhou 6 flight officials alsoconducted a final recovery drill in the Siziwang Banner region of InnerMongolia where the spacecraft and its two astronauts are expected to land,state media reported. Recovery teams conducted the thirdand final landing drill Thursday night with six helicopters and 14 specialvehicles prepared to aid Shenzhou 6's post-landing operations, Xinhuasaid. On Wednesday, state media reportedthat a herdswoman in the Otog Qi region of Inner Mongolia had recovered thedata recorder for the Long March 2F rocket that boosted Shenzhou 6 into orbit. The flight recorder was designed toseparate from the rocket's second stage as it dropped back to the ground overOtog Qi, said Zhu Habin, who heads a land emergency rescue team, according to Xinhua. The herdswoman, Lian Hua, returnedthe data recorder to Chinese space officials for later study, the news agencysaid.